Cats shed skin flakes and deposit them in their fur when they groom. This is dander. Allergy-causing proteins in the dander can provoke reactions including hives, rhinitis and asthma. Thorough removal of dander in the home will significantly reduce symptoms associated with a cat allergy. Unfortunately, sometimes either the cat or the person who's allergic must be removed. The allergy-causing substance is in the dander, not the fur. Dander is made of airborne saliva and urine-derived proteins. Licking transfers the dander, along with saliva and urine, to the cat's fur. But dander can remain suspended in house dust for a long time, hence an allergic reaction can occur even if the cat has been removed. Cat dander also sticks walls, furnishings, carpets, bedding and clothes. Completely eliminating cat dander may take two to five years. Wheezing and red, itchy eyes are the most easily recognized symptoms associated with a cat allergy. 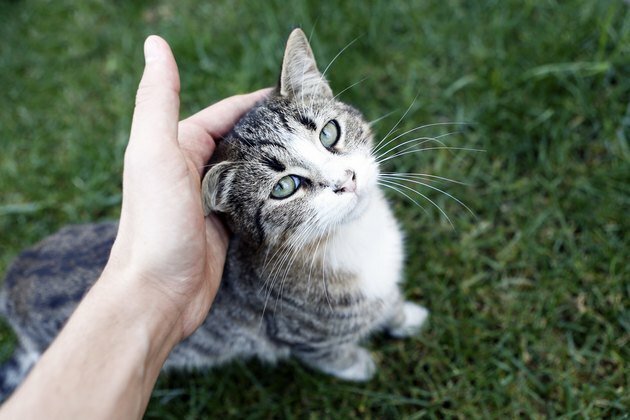 Contact hives, characterized by red, itchy welts, can develop when an allergic person touches cat fur or when the cat licks or scratches the person. Perennial allergic rhinitis occurs when nasal passages become inflamed as a result of inhaling cat dander. Symptoms include persistent runny or stuffy nose, red or watery eyes and postnasal drip. Chronic, severe, unstable asthma and worsening eczema are among additional symptoms. A person with a cat allergy has an exaggerated immune system that treats dander as a harmful substance. The immune system becomes sensitized on first contact with dander and produces antibodies to fight off the allergen. On repeated exposures the body produces more antibodies and chemicals that trigger an allergic reaction. Cats are one of the most common allergy-causing pets, affecting 15 to 30 percent of people with allergies. A cat allergy is of special concern, because it can trigger asthma attacks in 20 to 30 percent of those with asthma and can lead to chronic asthma. Cat allergies are also more common than dog allergies. Skin and blood tests can diagnose a cat allergy. An allergist pricks cat allergens into the skin of the patient and looks for red, itchy welts or hives on the site. A blood test identifies the specific allergy-causing antibody. To confirm the allergy, an allergist may also recommend removing the cat for several weeks and thoroughly cleaning the house to remove all traces of hair and dander. An improvement of symptoms will confirm the diagnosis. The best treatment for symptoms of cat dander allergy is to avoid exposure entirely. If you cannot part with your cat, restrict it to a few rooms in the house, thoroughly clean the house, install a high-efficiency filter and wear a dust mask when changing cat litter or house cleaning. An allergist may recommend a topical or oral antihistamine to relieve itching and swelling. Decongestants may relieve symptoms of allergic rhinitis.